I’ve written on the blog a few times in the past about my struggle with my weight. I have always been a thin person naturally without watching what I ate and working out. As I got married and further into adulthood I realized if I wanted to stay that way I was going to have to learn to exercise! I enjoy exercising and workout 4-5 times per week doing everything from running to Pilates to boxing. It’s my “me” time and I love it. Despite working out over the past few years as I approach 40 my body shape has drastically changed. I’ve gone from gaining weight in my bottom half to gaining it my middle. And NOTHING has gotten it off. In all honesty, I don’t have much weight to lose…just maybe 15 pounds…but the inability to lose it despite being very active and trying every fad diet out there has been so frustrating. Like I mentioned above, I was able to lose 45+ pounds of baby weight in six months after my third son was born years ago so I finally decided to go back to Weight Watchers because it worked for me before. The system is different now but so far I’m truly enjoying it and starting to see some baby steps of progress so I’m very optimistic! 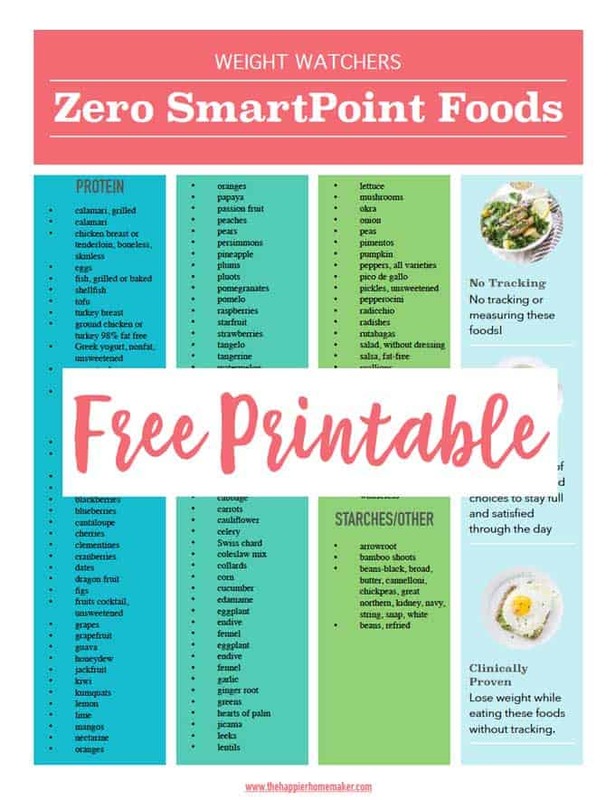 Which Foods are Weight Watchers Zero Points Foods? I’m glad you asked, here they are by category. Be sure to scroll to the bottom to download a printable reference guide to keep handy as well. salad with lettuce, cucumber, squash, black beans, corn, and leftover grilled shrimp-only 2 points for my salad dressing! Veggie omelet, topped with spicy salsa-0 points! If you’re not sure how to download or print this printable, reference the video below. And for reference I am allotted 23 points per day with 35 extra flexible points I can use throughout the week. To be honest, once I got used to the program after about a week, I rarely use my extra points and often come in under my daily budget without feeling hungry or deprived, it’s been amazing! I started Weight Watchers on June 1, 2018. As of August 18, 2018, I have lost 32 pounds and have 30 more to go. I love the Freestyle – I rarely go over my daily points and have lost every week except one (had TWO parties that week!). I recommend it to everyone who needs to be accountable (weigh-ins) and who needs the point system to plan their meals. I search the web daily for new recipes to try. My husband doesn’t need to lose any weight but he likes most of what I fix – he just eats ore of it and he works in the city so he can have a big lunch and then eat snacks when he’s hungry. it’s really the most workable plan I’ve seen like you, it’s just math and accountability! What does the different color columns mean? No meaning to the color, just makes the printable chart easier to read! I’ve never tried W.W. but thinking of doing it the way you are. I’ve list 12 pounds and I’m now stuck . Cant seam to lose weight. My name is Karen.